Acquiring 10 oz palladium bars from Kitco Metals is a great choice for palladium investors who value highly respected bullion brands with low premiums in a 10 oz palladium ingot form. Our 10 oz palladium bars are made with fine .999 palladium bullion by some of the world's most reputable palladium refiners and palladium mints. We often sell and ship various 10 oz Johnson Matthey palladium bars, 10 oz Umicore palladium bars, 10 oz PAMP palladium bars, 10 oz Metalor palladium bars, and other highly sought after ten ounce palladium ingot hallmarks. Officially discovered in the early 19th Century, modern mining data shows only just over 6,000 tonnes of palladium have ever been mined. Although gold is nearly 4 times more rare in the Earth’s crust than palladium, human beings have been mining gold for many thousands of years, thus above ground supplies of gold bullion dwarf today’s refined and available physical palladium bullion supply. To date about 230 times more silver and 30 times more gold have been mined compared to palladium. Safe shipment of palladium ingots in the mail is more common than you might think. Take fully insured, fast discreet delivery of 10 oz palladium bars to your door. Upon fully cleared payment of your order with Kitco, your 10 oz palladium bar(s) will be secured tightly in nondescript packaging. All 10 oz palladium bar parcels are shipped with full insurance, postal tracking, and adult signature requirements. 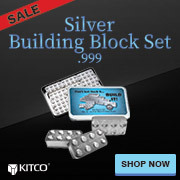 You can store your 10oz Palladium Bar 0.999+ safely and securely with Kitco Allocated Storage. Kitco offers you global options for gold, silver and platinum bullion storage that is fully segregated, insured and allocated. Kitco's network of top-tier vaults includes some of the most secure storage facilities in the world, in Canada, Hong Kong or the United States (COMEX approved). Cayman Islands storage is also available (certain conditions apply). Find out more about keeping your gold, silver and platinum purchases secure, with our Global Precious Metals Storage Solutions. The 10 oz palladium bar(s) you receive may be manufactured by a different refiner and may appear different from the one(s) illustrated here. The 10 oz palladium ingot(s) you receive may not be in mint condition.